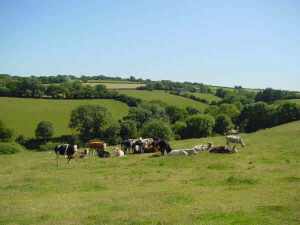 Blackdown is a 160 acre farm of grass and corn fields situated equidistant between the sea port of Dartmouth and the market town of Totnes (approx 10-15 mins car journey). 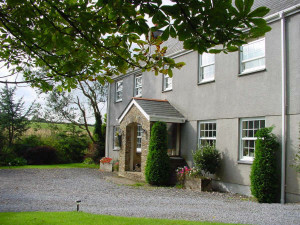 We offer quality accommodation in peaceful surroundings. Originally John’s parents came to the farm in the 1930’s during the depression, renting it, as was the norm then. In time they bought the 50 acres as sitting tenants. 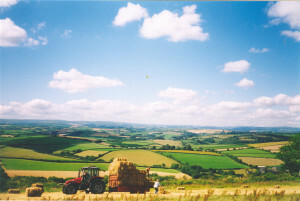 John has increased the acreage to its present size over a number of years. He was born in the house and I moved in with my suitcase several decades ago. We now have a beef suckler herd and also grow corn to help feed them – thereby making us self sufficient. Our son, Nick, helps look after the animals, which makes a change from his full-time desk job. Eventually we extended the house with the intention of taking guests, therefore all the rooms are sizeable with large en-suites. For more information on the available rooms, click on Bed & Breakfast. 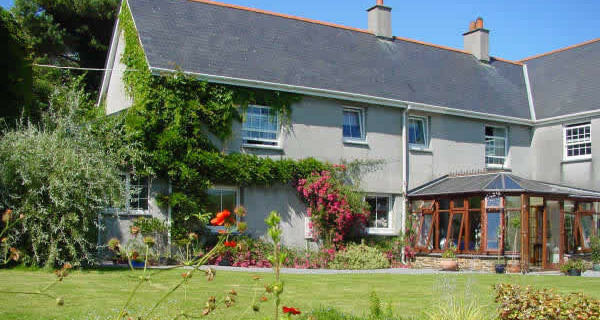 We are also letting out our new barn conversions on a self-catering basis. For more information, click on Self Catering Barns.